The women were headed to a clinic nearby before the incident took place. 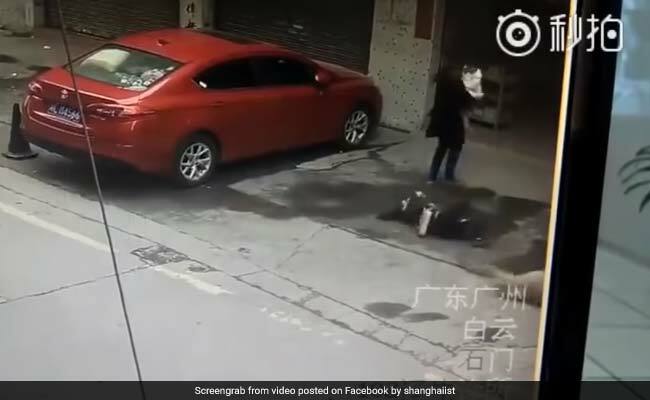 A scary video recorded in China captures the exact moment a woman was left unconscious after a dog fell on her. While the dog escaped after the fall, the woman was left with fractures in three bones of her neck. According to Shanghaiist, the video was captured on a surveillance camera in Baiyun district of China's Guangzhou. The clip shows the woman walking with another woman carrying a baby. Suddenly, as if out of nowhere, the dog came falling down a building and landed straight on the woman's head. She was immediately left unconscious while the dog ran away. According to reports, the women were headed to a clinic nearby before the incident took place. A doctor came to the woman's rescue and she was later rushed to a hospital. She only regained her consciousness after 12 minutes, reports Shanghaiist. "It's raining cats and dogs isn't just an expression in China," a Facebook user commented on the video. "Well... that is something you don't see every day," said another.